This ties into Sony’s recent reveal of an in-progress virtual reality headset at the Consumer Electronics Show 2011 in Las Vegas. 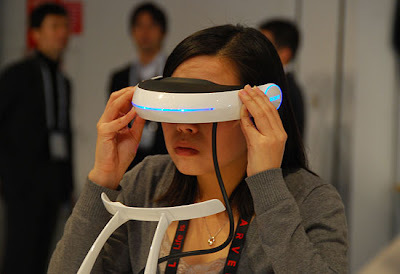 There’s no further information yet available about Sony’s HMD (head mounted display) device, but it’s becoming clear that Sony is putting its weight behind the technology. “Another thing that’s coming back which I’m very excited is the notion of virtual reality,” said Hocking in the video interview. “So we have our new HMD – or head-mounted display – which was announced at CES earlier this year, and you can see that we can now get back to where we really wanted to get with virtual reality in the ’80s. “We’ve now got the power to do it, we’ve got the screen resolution to do it, we’ve got the processing power to update fast enough so we can have very immersive experiences on head-mounted displays in gaming in the not too distant future. “Being in a virtual world where I can see my virtual hands or a virtual gun with all the things we can do in the gaming world is going to be absolutely amazing,” Hocking continued. Though Sony has been focusing on advancing 3D technology lately, it’s clear they’re already thinking about the next big thing.